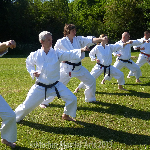 Kata are sequences of moves in a predefined order; passed down for generations. 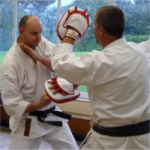 The more a kata is practised, the less conscious thought is used, so that eventually the body seems to perform the kata on it’s own, leaving the mind to concentrate on the intention behind the moves. 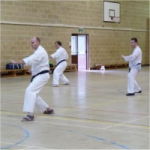 Shoto-Ryu practises around 30 Karate Kata, of varying origins, although many of them are very similar to those practised by Shoto-Kai and Shoto-Kan.
Kumite literally translates as ‘grappling hands’ and means ‘sparring’, but can take many forms, from a one move set piece to a ‘free for all’. Shoto-Ryu does not participate in ‘full contact’ sparring, and insists on control and respect for ones partner(s) at all times. Fighting and aggression is strictly forbidden. Kihon is the practice of basics. It is used to ‘program’ the body with technique. This starts with very basic movements, where usually, one movement is repeated many times. But this can be built on until we have a series of movements, that although basic when performed one at a time, now require fluidity and skill to perform. All our techniques are practiced with full control to ensure that no one gets hurt. Correct distance from a partner is taught from a very early stage. This embeds the ability to control your strikes so that your partner is not harmed. All techniques are practised against an opponent to increase understanding of the moves being performed. 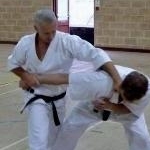 This is an important part of martial arts and is a fundamental part of what we do. This helps concentration during Kata by enabling you to visualise the techinques in action as you perform them. Pad work is important in order to understand the generation of power, to be able to follow through on a technique and to focus correctly on the target. It is also essential that a practitioner understands the stresses of impact involved when striking.